Somewhere in the northern part of the country people of all caste, race and creed are seen walking with the flame of faith burning strong within, goading them relentlessly on a mountain trek towards Vaishno Mata (Mother) Temple. The walking steps are not limited to those of men or women but people of all age groups continuously walk on the hill. There are elderly people on palanquins or ponies weaken by age but not by spirits constantly chanting Mata’s name silently in their heart and there are small kids hopped over Porters (Pithus person carrying small kids on their back) enjoying the whole experience. And there are others who are walking on their feet (bare and with shoes); the arduous trek does have an impact on their physical stamina but their devotion remain steadfast. Drenched in sweat, gasping & breathing through their mouth they are catching their breath when suddenly a voice echoes the surrounding with someone calling “JAI MATA DI”. Such is the magic and aura of this phrase that all of them reciprocate it by saying Mata’s name (JAI MATA DI) with equal zest and fervour and re-start their trek. Such is the magic and aura of Maa Vaishno Devi and her name!!! The northern most part of India is special for more than one reason. While it boasts of what people refer to as the 'heaven on earth' in form of scintillating Kashmir, it also is abode of many pilgrimages which provide peace and tranquil to the devotees. One such abode of peace is the holy shrine of Mata Vaishno Devi Temple (or simply Vaishno Devi,as it popularly called). Situated amidst the mighty Trikuta mountains in a small town called Katra in Reasi district of state of Jammu and Kashmir, the holy shrine of Mata Vaishno Devi is surely a beacon of faith and devotion. The holy cave of mata (mother goddess) is situated at an altitude of more than 5000 feet from the sea level and on the trek of ~13 Kms from the base camp in Katra. The eternal flame of devotion stemming from a firm belief that whosoever visits mother goddess devotedly to ask for a boon is never returned disappointed persuades millions and millions of devotees to undertake the trek and take shelter under the boundless love of Mata Rani. Chalo bulawa aaya hai, Mata ne bulaya hai (Let’s all go & feel bless, There is a call from Mother Goddess). . . The trip to holy shrine is completely a prerogative of those who receives the call of mother goddess. It is not only a belief but a strong experience by the devotees that mother goddess sends signals of call to her children and only those whom the signal is sent can actually come, visit and get her blessings. This is also expressed from some of the common adages about mata’s call for the devotee like ‘mata ka bulaya’ (meaning only those whom Mata calls are eventually able to go for her darshan (visit)), ‘Maa aap bulandi’ (meaning mother herself calls) etc. I can vouch that and I have myself experience the same many a times. I can recall one of my childhood experience when my father’s friend couldn’t get Mata’s darshan even after completing the whole trek as there was huge rush up there and he had time constraint as he had to catch the return train back to his destination. I was also planning since long for mata rani (goddess mother) darshan but for some reason or the other, the trip just was not able to materialize. Finally thanks to my younger sister constant urge, we all were able to finalize the trip (and complete it with immense pleasure and satisfaction). Though, I strongly believe that this rule of ‘Call of Divine’ is applicable to all pilgrimages. In the first post, we will reach Katra from Jammu to start the trek to Mata Vaishno Devi. We will also read about the legend and history of Mata Vaishno Devi. In the fourth & final post, we will explore and experience two other abodes of Mata – Kol Kandoli Temple (which is known as pratham darshan meaning first visit) and Deva Mai Temple - which (though) should be visited first before going to Vaishno Devi as Mata has first revealed herself there before finally resting amidst Trikuta Hills (as we will be reading about these in legend of Mata Vaishno Devi). Let’s start our journey to Mata’s holy shrine by chanting her name from the heart – Jai Mata Di (Hail Mother Goddess). Jammu is the winter capital of the state of Jammu and Kashmir (Srinagar being the summer capital of the state) and considered to be the most apt focal point for the devotees planning to undertake the trip to holy shrine. Jammu is well connected to many major places across country by air, rail and road. 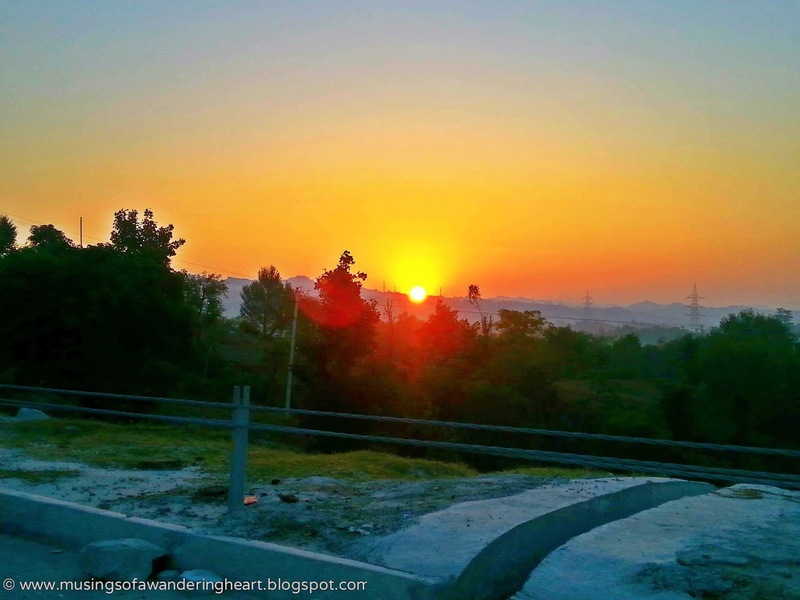 It is situated on the banks of the river Tawi (hence the name Jammu Tawi) and popularly known as the City of Temples. Jammu also serves as the conjunction point for travel to other important places in the state viz. Srinagar, Laddakh etc. There is an interesting story about the founding of Jammu city. Jammu was founded by Raja Jambu Lochan in the 14th century BC. During one of his hunting campaigns, he reached the Tawi River where he saw a goat and a lion drinking water at the same place. Having satisfied their thirst, the animals went their own ways. The Raja was amazed, abandoned the idea of hunting and returned to his companions. Recounting what he had seen, he exclaimed that this place, where a lion and a lamb could drink water side by side, was a place of peace and tranquillity. The Raja commanded that a palace be built at this place and a city was founded around it. This city became known as Jambu-Nagar, which then later changed to Jammu. Train Services to Jammu: As mentioned above, Jammu is well connected by train from many major places across country. Further, there is also a station at Udhampur which is about 70 Kms from Jammu and with the construction of railway station and establishment of rail link at Udhampur, devotees now have additional option to go till Udhampur via train and then go to Katra either by bus or taxis. However, considering the frequency and round the clock availability of buses and taxis to Katra, Jammu remains the more preferred and convenient option while going to Katra. All types of trains are available to Jammu including Rajdhani, Duronto etc., while these do stick to their scheduled arrival and departure time; there can be some inordinate delays owing to bad weather (especially fogs more prevalent in winters when the trains are bound to be delayed). The beddings and blankets are available in Rajdhani (free of cost) and Duronto (chargeable at INR 25), devotees travelling in other trains should carry the blankets as per the requirement. However, this is to be taken care of in case of travel by sleeper class as the blankets are provided when travelled in first, second and third AC. You can checkout various trains running from Jammu Tawi Station here. You can checkout various trains running from Udhampur Station here. We started our journey from the National Capital Delhi and booked reservation in Jammu Rajdhani Express which departs from New Delhi railway station daily at 2040 Hours in the evening and reach Jammu next morning at 0545 Hours. The train was bang on time and dropped us at Jammu Railway station at the wee hours of the morning. It was like a homecoming stepping a foot on Jammu Station with a varied emotions racing inside me. I did my entire schooling from Jammu and the city still holds a special place for me as it did gave me some of the most wonderful memories of my life. Though its been a long time since we moved to Delhi, even now a slight reference of the place is sufficient to create ripples in my heart. We had already pre-booked a taxi for Katra which was waiting for us outside the station near taxi stand. After recollection those wandering thoughts, we finally started our journey to Katra. Bus / Taxi Services from Jammu to Katra: The distance from Jammu to Katra is approx 50 Kms and can be undertaken through National Highway 1A. At a point nearly 35 Kms from Jammu (called Domel), the road branches off into two while one road heads towards Srinagar the other leads to Katra. Ordinary and luxury buses are available from Jammu to Katra at a frequency of 10-15 minutes. Devotees can take these busses either from the State Road Transport Bus Stand (which is around 1 Km to 2 Km from Jammu Railway Station) or from outside the Railway Station. It takes around 2 hours to cover the 50 km stretch from Jammu to Katra. 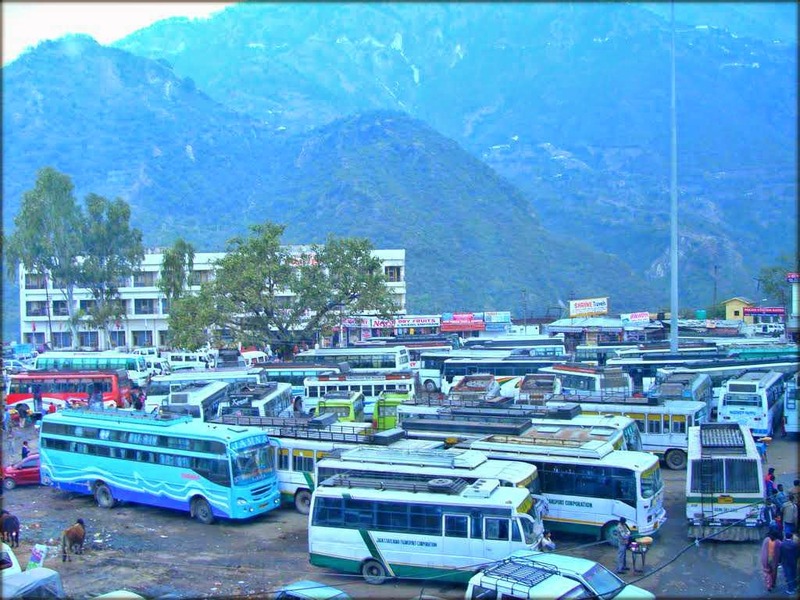 The applicable fare from Jammu to katra ranges from INR 50 to INR 75 depending upon the bus size. 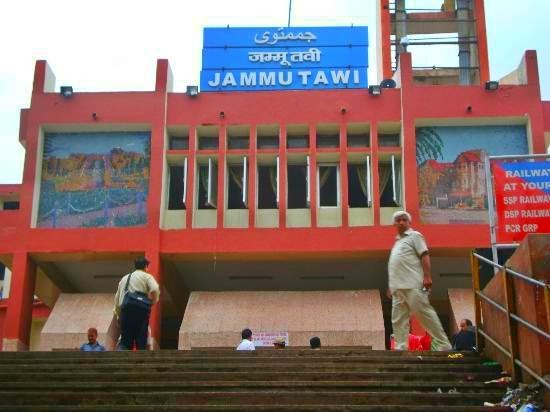 Apart from the buses, the private Taxies for Katra are available from the Jammu Tawi Railway Station and Jammu Airport. While the moment one comes out of the station or airport, he / she is accosted by taxi drivers proposing to take them to Katra, it advisable to avail the services of government established prepaid taxi counter established at railway station and airport guarantying the officially approved rate. Typically speaking, the 4 seater taxi charges in the range of INR 1200 to INR 1500 for drop at Katra and takes about 1.25 to 1.30 Hours to complete the journey. The hired taxis from Jammu normally stop on the way at some dhabha or small food joint for tea or coffee. Our taxi also followed the suite and halted enroute Katra for taking tea. Since it was an early morning hour coupled with the hilly terrain on the way, there was some inherent chill in the air. The sun was making a desperate attempt to come out of the clouds with its brighter rays And no sooner did it peeped from the clouds, the whole scenario was filled with golden radiance and subtle warmth of its rays. The early morning chill admixed with the slender warmth of the sun really rejuvenated the whole body. The terrain from Jammu to Katra is hilly and passes through the range of mountains and green forests providing majestic view of the mountains, flora and fauna of the region. The devotees can surely witness some breathtaking views enroute Katra before reaching the check post just few kilometers before Katra. After the routine checking by the security personnel, the vehicles are given green signal to go ahead and the vehicle reaches Katra bus stand within 20 minutes time. The terrain from Jammu to Katra is hilly and winding; therefore the passengers often experience nausea and vomiting. Devotees prone to vomit or nausea should take proper medication of the same before starting from Jammu. In case of hiring a taxi, instead of availing random taxi services, avail the services of government established prepaid taxi counter which guarantees optimum official prescribed taxi rates. Katra Railway Station: Traditionally for reaching katra, one has to first go to Jammu and therefrom catch a bus or hire a taxi to Katra. However, just few months ago, the railway station at Katra has started functioning and the devotees can directly reach Katra through train as they plan to undertake the trip to the shrine. Currently, there is only one permanent train to Katra which is Shri Shakti AC Express (Train Number 22461) which runs from New Delhi (Station Code: NDLS) to Shri Mata Vaishno Devi Katra (Station Code: SVDK). The train runs from New Delhi daily departing at 1730 Hours in the evening and reaches Katra at 0510 Hours in the morning after covering the distance of 654 Kms and having 8 scheduled halts. Apart from this there are some temporary holiday trains too which run temporarily for one or two months from various locations to Katra (like currently there is one train running from Muzaffarpur to Katra, which runs weekly and has limited run from Sep 30 to Nov 25 2014). Apart from above, there are couple of local trains running from Jammu to Katra (and one from Pathankot to Katra) which run daily catering to local passengers. Devotees should plan well in advance if they intend to book themselves in Shri Shakti AC Express as the train generally runs full (being the only daily train to Katra) and the tickets are booked to full as soon as the booking window of two months opens. If you intend to travel by train till Jammu or Udhampur, prefer the former as the availability of buses and taxis are more frequent therein. Katra is a small town located in the Reasi district of the state of Jammu and Kashmir situated on the foothills of Trikuta mountains wherein the holy shrine of Mata Vaishno Devi is situated. There are plenty of hotels, guest houses, lodges and dormitories in Katra catering to devotees across all segments. The moment one lands in Katra, the group of agents try to lure them out listing various lodging options. The devotees can avoid paying heed to these agents and can do the search on their own once they reach Katra bus stand as most of the lodging facilities are within the parameter of 1-2 KMs. Alternatively (and more advisably), if you have planned your trip much in advance, you might just want to pre book your stay in various rented accommodation facilities provided by Shri Mata Vaishno Devi Shrine Board which are well maintained and economical. These accommodation facilities are available at all the main junctures viz. Jammu (at Vaishnavi Dham and Saraswati Dham near Railway Station), at Katra (at Niharika Yatri Niwas and Shakti Bhawan situated at the Bus stand) Katra. Another dormitory accommodation, Trikuta Bhawan, Katra is available at near the 2nd Yatra counter (YRC II). The lodging facilities are also available during the trek at Adkuwari, Sajichatt and at main Bhawan for the devotees desirous of taking rest in between. You can checkout various accommodations facilities provided by Shri Mata Vaishno Devi Shrine Board here. These can be booked online by visiting Shrine board website which has a separate link for Online Services. Ours was a bit spontaneous trip and that’s why (perhaps) we could neither book our reservation in the direct train to Katra nor were we able to get accommodation in Shrine Board run facilities. Our taxi driver was a nice man and showed us couple of hotel options of which we chose the second one as it was within the closer proximity of the Katra main market and also suited our budget. Legend of Mata Vaishno Devi. . .
History of the Shrine: Like with most old Shrines, it is not possible to ascertain when exactly the pilgrimage to the Holy Shrine started. A geological study of the Holy Cave has indicated its age to be nearly a million years. Vedic literature gives no reference to the worship of any female deity, although the mountain Trikuta does find its mention in Rigveda, the oldest of the four Vedas The practice of worshipping Shakti, largely started in the Puranic period. The first mention of the Mother Goddess is in the epic Mahabharat. When the armies of Pandavs and Kaurvas were arrayed in the battlefield of Kurukshetra, Arjun, the chief warrior of Pandavs upon advice of Sri Krishna; meditated upon the Mother Goddess and sought Her blessings for victory. This is when Arjun addresses the Mother Goddess as ‘Jambookatak Chityaishu Nityam Sannihitalaye’, which means ‘you who always dwell in the temple on the slope of the mountain in Jamboo’ (ancient name of the present day Jammu). Emergence of Mother Goddess: As per the legend, during the period when the Goddess was busy in annihilating the Asuras (the demons), Her three main manifestations viz. Mata Maha Kali, Mata Maha Lakshmi and Mata Maha Saraswati got together one day and pooled their collective Tejas or spiritual strength. A stunningly bright light emanated from the place where the Tejas of the three manifestations coalesced and a beautiful young girl emerged out of this Tejas. The young girl asked them, "Why have I been created?'' The Devis explained to her that they had created her so that she would live on earth and spend her time in upholding righteousness. The Devis added, "Now, go and take birth in the house of Ratankar and his wife who resides in the southern part of India, and who are great devotees of ours. Live on earth. Uphold righteousness and evolve yourself spiritually so that you reach higher levels of consciousness. Once you have attained the appropriate level of consciousness you will merge into Vishnu and become one with him'', so saying they blessed the girl. Sometimes later a very beautiful girl child was born to Ratankar and his wife. The couple named the child Vaishnavi. The girl right from her childhood displayed a hunger for knowledge which was like a vortex and which no amount of teaching and learning could sufficiently satiate. Subsequently, Vaishnavi started looking into her inner self for knowledge, and soon learned the art of meditation and realized that meditation and penance only could bring her close to her greater objective. Vaishnavi thus relinquished all household comforts and went deep into the forest for Tapasaya (meditation). Meanwhile, Lord Rama, during his fourteen years of exile happened to visit Vaishnavi who recognized him immediately as no ordinary being but the incarnation of Lord Vishnu, and immediately asked him to merge her into himself so that she could become one with the supreme creator. Rendezvous with Lord Rama: However Lord Rama, knowing that it was not the appropriate time, dissuaded her by saying that he would visit her again after the end of his exile, and at that time if she succeeded in recognizing him, he would fulfill her wish. True to his words, Rama visited her again after being victorious in the battle, but this time he did so in the disguise of an old man. Unfortunately, Vaishnavi was unable to recognize him this time and was distraught. Upon this, Lord Rama consoled her that the appropriate time for her being one with the creator had not come, and that time would come eventually in 'Kaliyug' when He (Rama) would be in his incarnation of 'Kalki'. Rama also directed her to meditate, and set up an Ashram at the base of Trikuta hills, to elevate her level of spirituality so as to bless mankind and rid the poor and destitute of their sufferings. Only then would 'Vishnu' merge her into himself. Vaishnavi, immediately set off for the northern part and after immense hardships, reached the foot of the Trikuta Hills. After reaching there she set up her ashram there and began to meditate. Bhairon Nath: As predicted by Lord Rama, her glory spread far and wide, and people began to flock to her Ashram to seek her blessings. As time passed, a Tantrik named Gorakh Nath who had a vision of the episode between Lord Rama and Vaishnavi in the retrospective time frame, became curious to find out whether Vaishnavi has been able to attain a high level of spirituality or not. He, therefore, sent his most able disciple 'Bhairon Nath' to find out the truth. Bhairon Nath on locating the ashram started observing Vaishnavi secretly, and realised that though a 'Sadhvi' she always carried bow and arrows with her, and was always surrounded by langoors (apes) and a ferocious looking lion. Bhairon Nath was enamored by Vaishnavi's extraordinary beauty, and losing all good sense he began to pester Vaishnavi to marry him. Meanwhile a staunch devotee of Vaiashnavi, Mata Sridhar organised a Bhandara (Community meal) in which the whole village and Guru Gorakh Nath along with all his followers including Bhairon were invited. During the course of Bhandara Bhairon Nath attempted to grab Vaishnavi but she tried her best to daunt him. On failing to do so, Vaishnavi decided to flee away into the mountains to continue her Tapasaya undisturbed. Bhairon Nath however chased her to her destination. 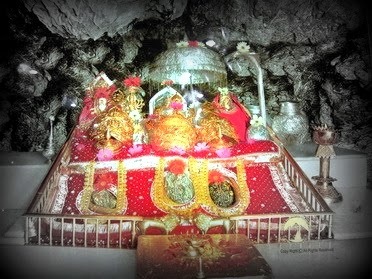 The goddess after halting at (present day) Banganga, Charan Paduka, and Adhkwari, finally reached the holy cave Shrine. When Bhairon Nath continued to follow her despite the goddess trying to avoid a confrontation, the goddess was compelled to kill him. Bhairon Nath met his ultimate fate when the goddess, just outside the mouth of the cave, beheaded him. The severed head of Bhairon fell with a force at a distant hilltop. Bhairon Nath upon death realised the futility of his mission and prayed to the deity to forgive him. The almighty Mata (Mother Goddess) had mercy on Bhairon and gave him a boon that every devotee of the goddess would have to have the Darshans of Bhairon after having the Darshans of the Goddess and only then would the yatra of a devotee be complete. Meanwhile, Vaishnavi decided to shed off her human form and assuming the face of a rock she immersed herself into meditation forever. Thus Vaishnavi, in the form of a five and a half feet tall rock with three heads or the Pindies on the top is the ultimate destination of a devotee. These Pindies constitute the Sanctum Sanctorum of the holy cave known as the shrine of Shri Mata Vaishno Devi Ji, which is revered by one and all. We will stop here for some time and you all enjoy your stay in Katra till we start our trek to the holy shrine of Mata Vaishno Devi in next post…Jai Mata Di (Hail Mother Goddess). Note:Pictures with asterisk (*) are sourced from the internet and rest have been clicked by me from my smartphone. Legend of Mata Rani has been adapted from Shrine Board website.